The Helen Bamber Foundation was founded in 2005 to help rebuild lives and inspire a new self-esteem in survivors of gross human rights violations. The Foundation has collaborated with JWT Dubai to produce two films, Vows and Auction, designed for use in the Middle East. Domestic violence and abuse against women is a huge, yet silent problem in the Middle East. Women tend to shy away from speaking about these sorts of things due to cultural sensitivites, and because they are embarassed. JWT Dubai wanted to highlight this problem and urge women to speak up. Auction deals with a global problem – human trafficking, and in particular, child trafficking, which is one of its worse forms. The Helen Bamber Foundation Vows and Auction ads were developed at JWT Dubai by executive creative director Chafic Haddad, art directors/copywriters Nizar Swailem and Ash Chagla, strategic planner Prabhakar Iyer, agency producer Glory Fayad and advertiser’s supervisor Mike Korzinski. Filming was shot by director Harold Monfils via Deja Vu Studioz, Dubai, UAE, with director of photography Bobby Dhillon, producer Manasvi Gosalias, editors Ayas Hassan and Sujan Mishra. Sound was designed and arranged at Imaginex Studios, Kuala Lumpur. Music was composed by Mike Bloemendal. 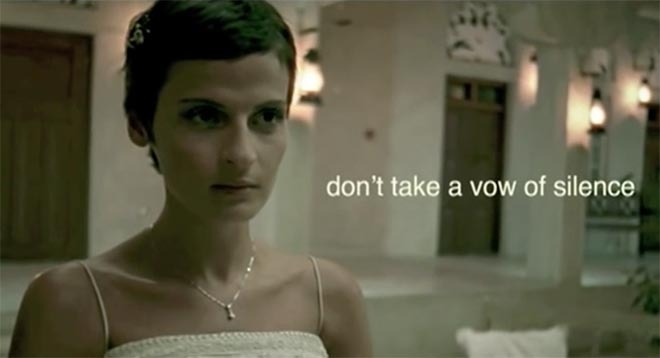 Vows won a bronze Lynx at the Dubai Lynx Awards 2009.